City of Melville Mayor Russell Aubrey. 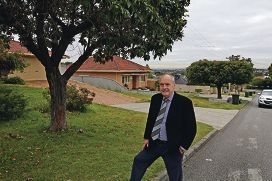 He cited problems raised in quiet suburban streets such as Kitchener, Bridges and Birdwood roads by developments being permitted to significantly exceed their intended R-coding of R30 under the code provisions and the significant impost they have on neighbouring residential amenity. The mayor called for chief executive Shayne Silcox urgently to prepare a report for council investigating the consequences of re-introducing a minimum plot area for multi-unit developments coded R40 and below. Presently the housing code comes into effect for developments coded R30. Mr Aubrey said the WA Planning Commission was reviewing its R-code legislation so that the multi unit housing code would kick in at R40. However, he felt that the Local Planning Scheme should limit it to R50 and above. ‘With the Willagee Structure Plan, with large-scale R40 proposed going out for advertising next month, immediate action is called for to prevent what has been referred to by my colleagues on the WAPC as the ‘unintended consequences’ of the MUHC impacting on quiet residential neighbourhoods,’ he said. Mr Aubrey told council that the WAPC’s amendment was a blanket approach and could not be relied upon to meet the needs of all individual local governments areas. Stirling and Vincent are also expressing concerns regarding the intrusion of high-density development that has resulted in their suburban streets. The WAPC amendment, out for public comment, states ‘it was not the intent to undermine the amenity and character or low-medium density suburbs’. ‘With council’s support I hope to raise the bar higher in Melville so that R40 is also precluded and thus all suburban streets are freed from this blight that has caused so much concern and heartache,’ the mayor said. The report is expected to be presented at the October council meeting.